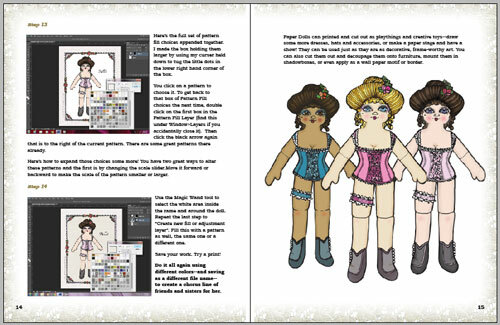 Containing Belle (A Wild West Dance Hall Girl) and her more settled sister, the Heirloom Lady doll, plus many pages of beautifully detailed clothing that they can share, this PDF file includes step-by-step full color tutorials on how to use Adobe Photoshop or similar image editing programs to color the dolls and their complete and expansive wardrobes. Also included are both dolls and wardrobes in full color versions and in black in white, ready for you to color digitally or with pens, pencils or your favorite media. Print them out in different sizes and make as many copies as you like for your own personal use. PLEASE respect copyright and do not make copies to sell.